Our member in the UK CrossReach has been recently awarded for its new project aimed at bringing together children and elderly people in Scotland. 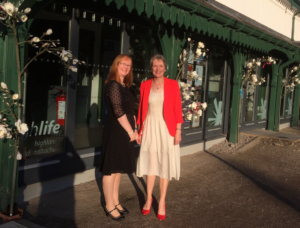 The award ceremony was organised by the Highland Third Sector Interface (HTSI) and took place last month in Strathpeffer (Scotland), aimed at giving visibility to local charities and their volunteers. The WOW project has been bringing children from CALA Junior World and residents of Whinnieknowe together. The participants built an intergenerational bound by sharing interests, activities, experiences, fun and laughter. The award was received by the Whinnieknowe Care Home Activities Coordinator Sarah Coulson, together with Jayne Macintosh from CALA. To know more about the award, please read Cross Reach news.